Real-time Battle RPG for iOS, “Lord of War”: Pre-registration Begins Today! | Aiming Inc.
Aiming Incorporated announces the start of its pre-registration for “Lord of War”, a real-time battle RPG for the iOS, as its service launch draws near. 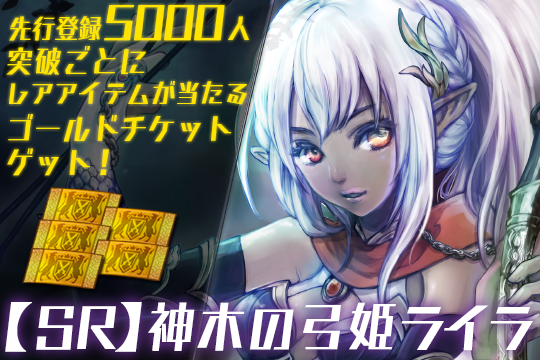 Moreover, Aiming also announces an ongoing Twitter Japan campaign which will run simultaneously in line with the pre-registration period for “Lord of War”. “Lord of War” is another card battle adaptation of the huge hit game, Lord of Knights, exclusively for the iOS. Players can nurture cards of various potential, and discover fun in exploration alongside friends. On top of that, other features include: joining a guild and engage in the large-scale “Dynasty Wars”, or cross swords one-on-one in the “Fight for Supremacy” over your own territory. Pre-registration for early-birds who wish to play Lord of War begins today, February 19th (Thursday). A serial code will be sent to those who have pre-registered by e-mail. Simply enter the serial code in the game and receive a limited “[SR] Laila, Bow Princess of the Divine Tree” rare card! And as an extra bonus in line with the pre-registration count, one “Gold Ticket” will be added for every 5,000 increase!